English Tosafist; died after 1256. He was of the well-known Hagin family, and son of Rabbi Moses ben Yom-Ṭob of London. He was the rab or chief rabbi of Lincoln (the Norman-French name of which was "Nicole"), and probably lived in the house now known as "the Jews' house" in that city; for this was in the possession of a certain Belaset of Wallington in 1287, and there is a deed which speaks of Belaset, daughter of the rab Berechiah (Davis, "Sheṭaroth," No. 156, p. 298). 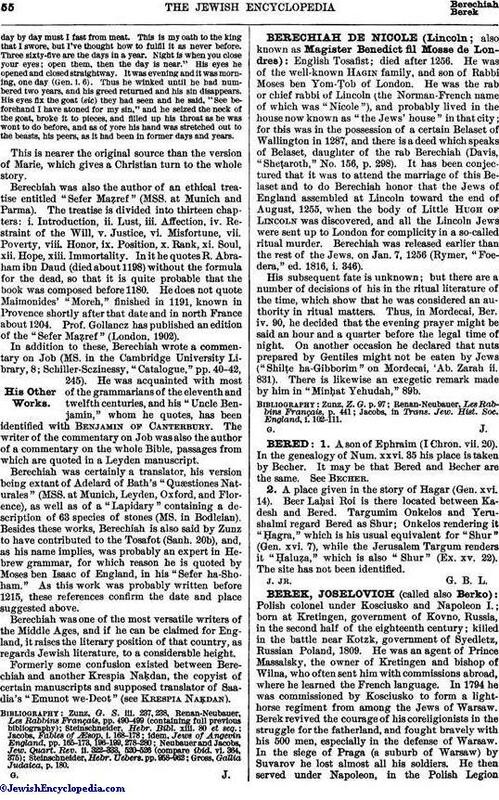 It has been conjectured that it was to attend the marriage of this Belaset and to do Berechiah honor that the Jews of England assembled at Lincoln toward the end of August, 1255, when the body of Little Hugh of Lincoln was discovered, and all the Lincoln Jews were sent up to London for complicity in a so-called ritual murder. Berechiah was released earlier than the rest of the Jews, on Jan. 7, 1256 (Rymer, "Foedera," ed. 1816, i. 346). His subsequent fate is unknown; but there are a number of decisions of his in the ritual literature of the time, which show that he was considered an authority in ritual matters. Thus, in Mordecai, Ber. iv. 90, he decided that the evening prayer might be said an hour and a quarter before the legal time of night. On another occasion he declared that nuts prepared by Gentiles might not be eaten by Jews ("Shilṭe ha-Gibborim" on Mordecai, 'Ab. Zarah ii. 831). There is likewise an exegetic remark made by him in "Minḥat Yehudah," 89b. Jacobs, in Trans. Jew. Hist. Soc. England, i. 102-111.